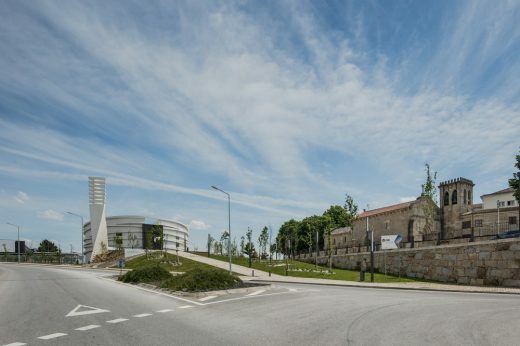 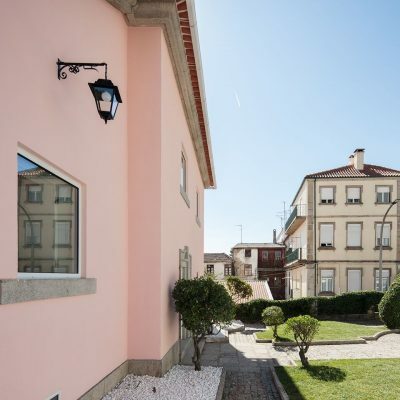 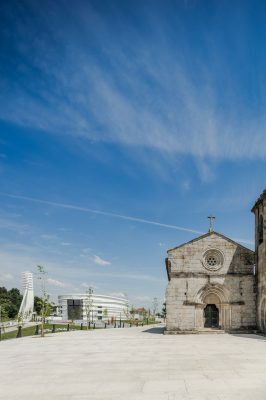 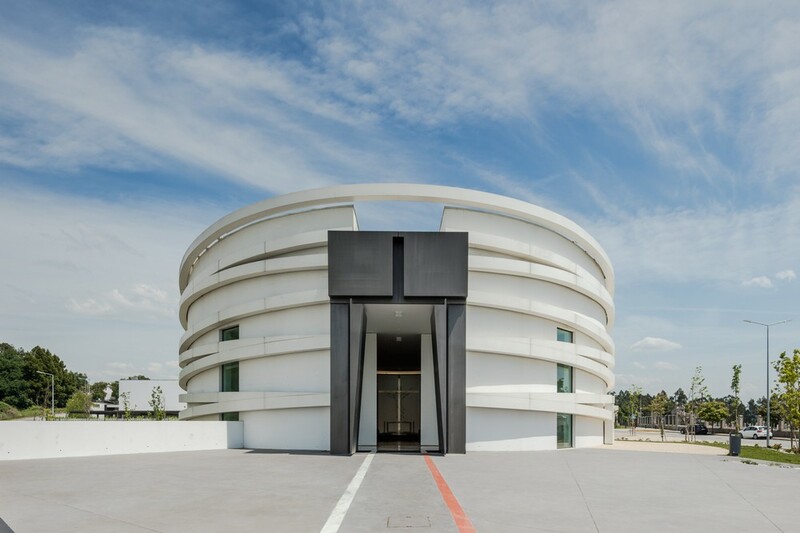 The church of S. Tiago de Antas is built in a privileged place with views over the natural landscape and the center of the local town. 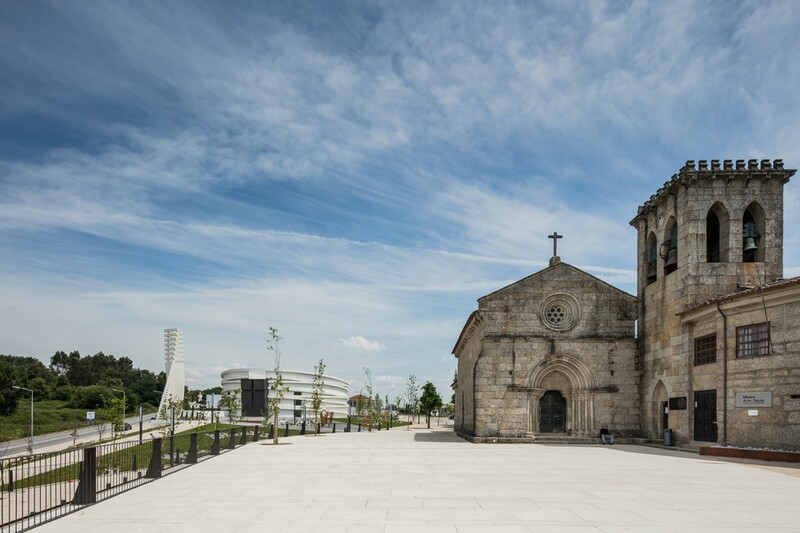 The building is integrated side by side and harmoniously with the past, which gives it a distinct character and reference for the community, especially for all who cultivate the faith. 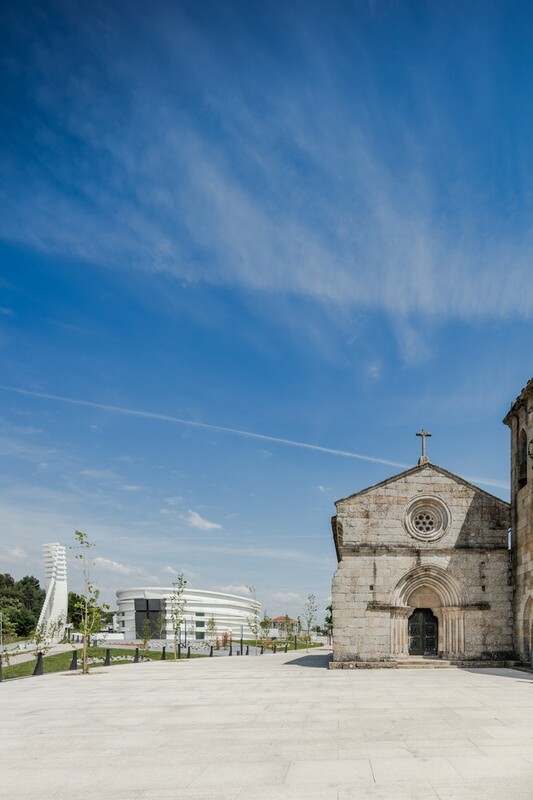 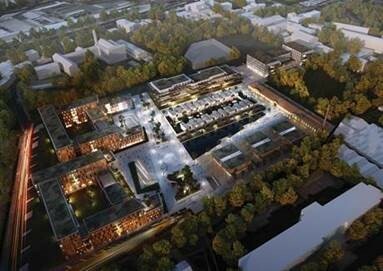 The elaboration of the proposal was preceded of a study of the location of surrounding spaces and the integration of the building in the site location. It was not simply limited to the study of an organized implantation in the land site but also an intense study of the history and religious activities associated to the locality. 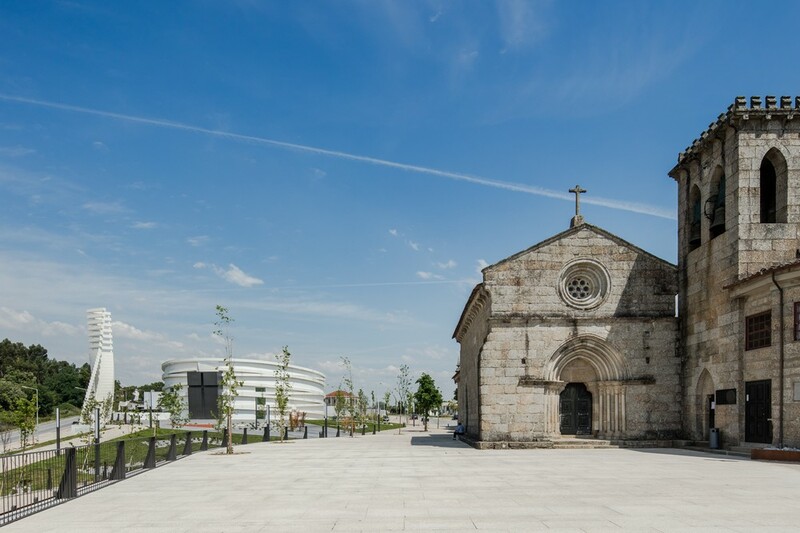 Its implantation works as a unifying element of the existing spaces in the surrounding, such as the Romanesque church (classified as Property of Public Interest since 1958), the mortuary chapel and the cemetery. 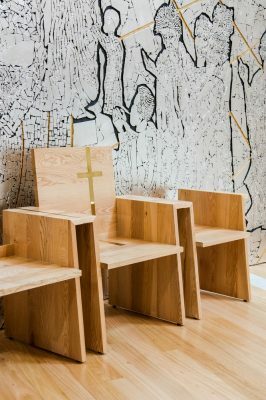 The church plant is simple, with no notable monumentality, and the volumetry was studied with the aim of not having a visual impact on the landscape. 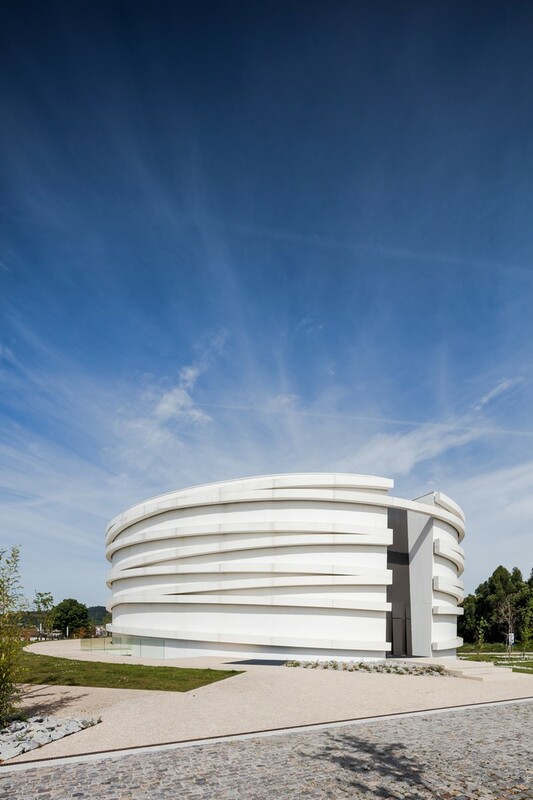 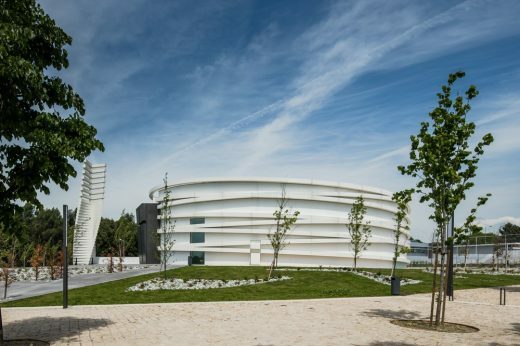 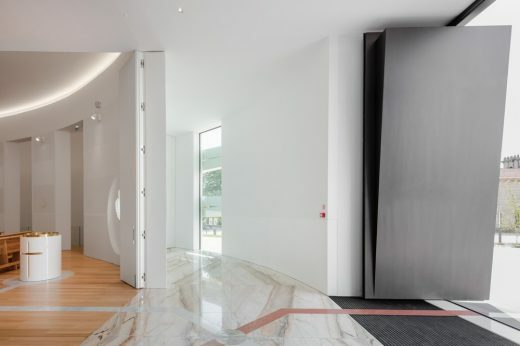 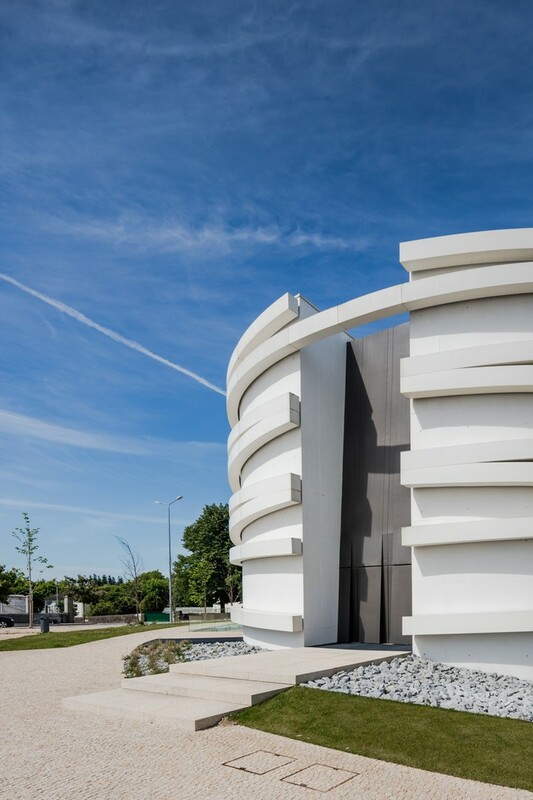 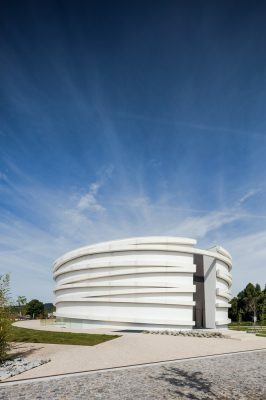 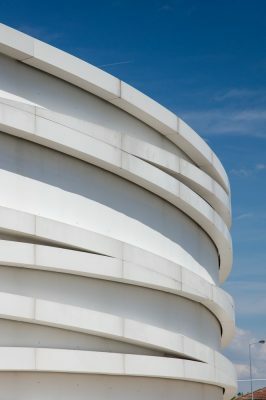 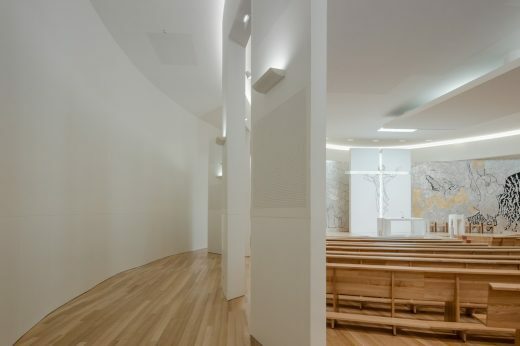 The volume develops on two floors, clearly separating the sacred space from the other spaces with cultural and educational functions for children and young people. 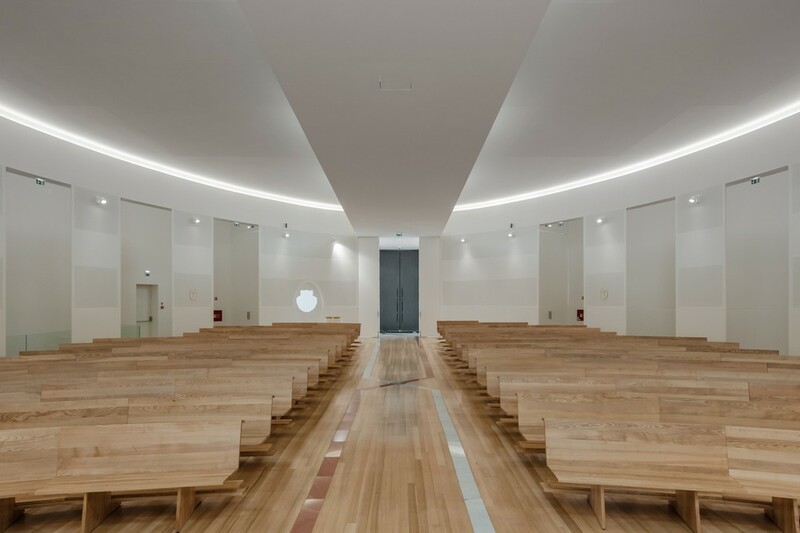 On the main floor, level 0, is developed the space for celebrations, with capacity for more than 500 people. 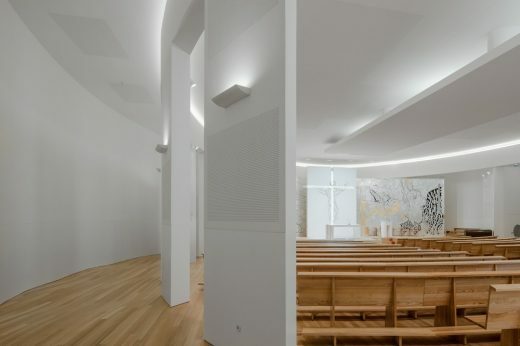 On the back of the altar are located all the points related to the pastor and sacristan. 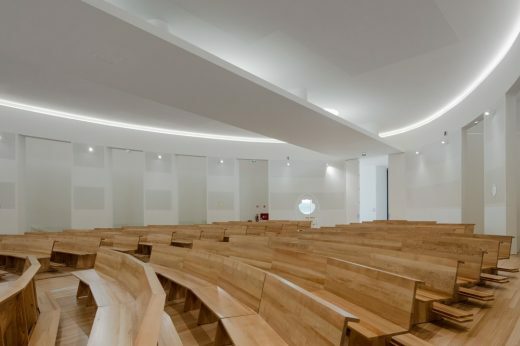 In the lower floor, level -1, are located 5 spaces for catechesis, one of which has the capacity to accommodate about 200 people, and can be used for shows or lectures. 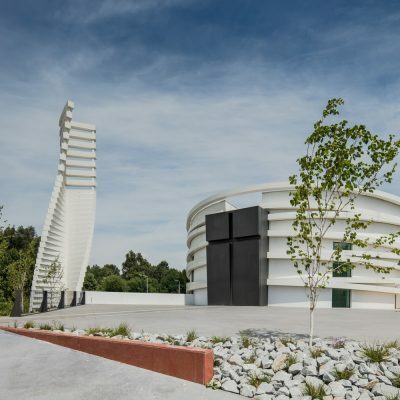 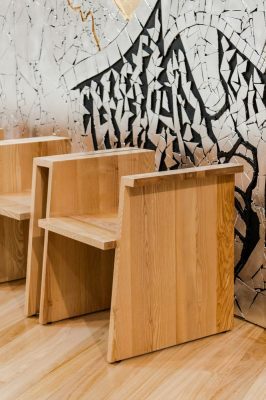 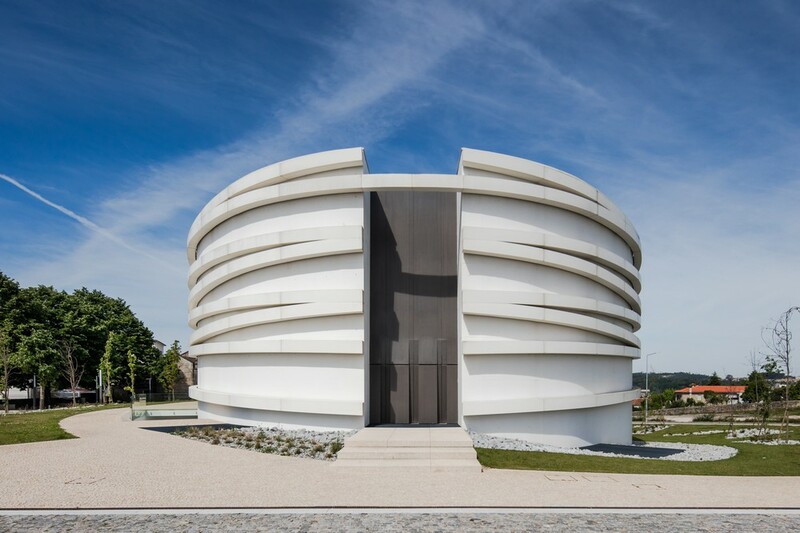 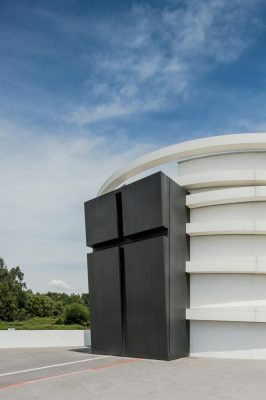 The project incorporates a vast symbolic significance, since several liturgical elements are present in order to create a narrative. The elliptical form of the church emerges from the chalice and cross of passion, and the rings surrounding the temple symbolize the crown of thorns, an instrument of torture used by the Romans during the crucifixion of Jesus. On the wooden floor are two marble lines that connect the exterior of the building to the altar. 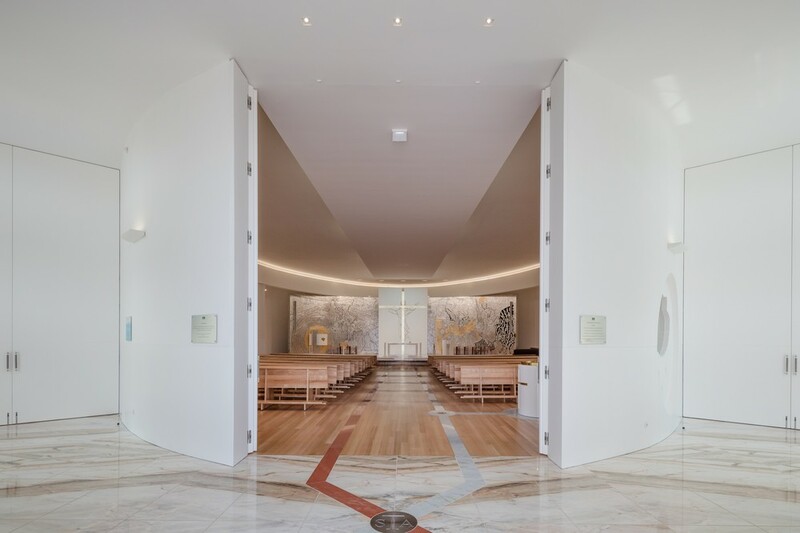 One of the lines represents the Jordan River, the place of Christ’s baptisms, connecting the exterior of the church to the baptismal font and then to the main altarpiece. 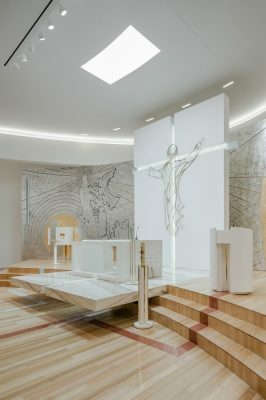 The other represents the blood coming from the sword of St. James, and connects from the outside to the pulpit where the readings of the sacred texts are made. 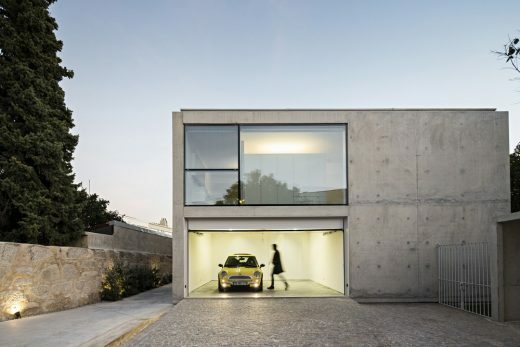 The volume materializes its shape through the exterior concrete walls with almost no openings, which incorporates a mysterious and austere image, despite the suspended arches that encompass it. 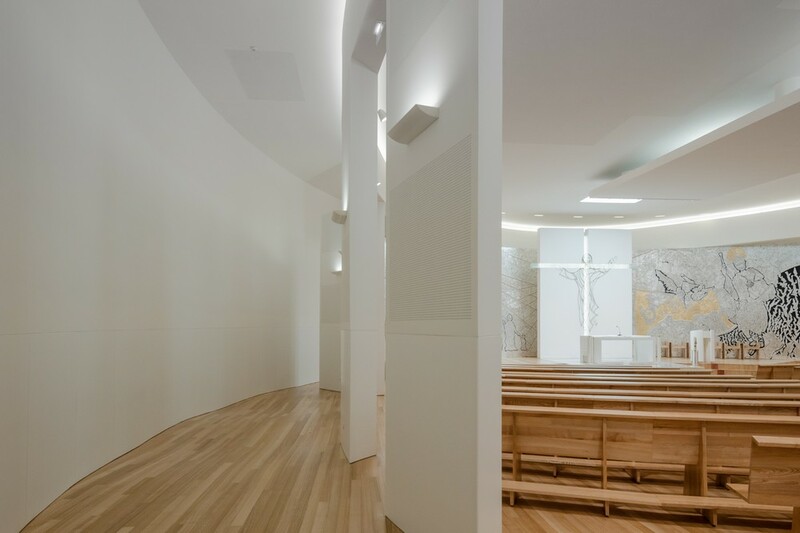 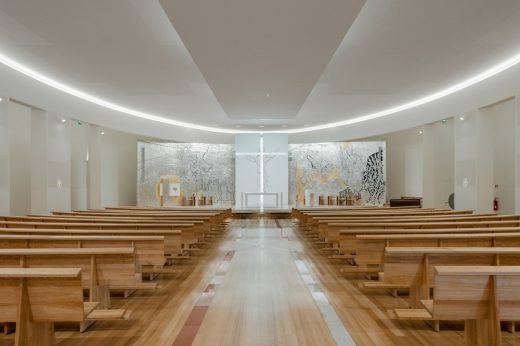 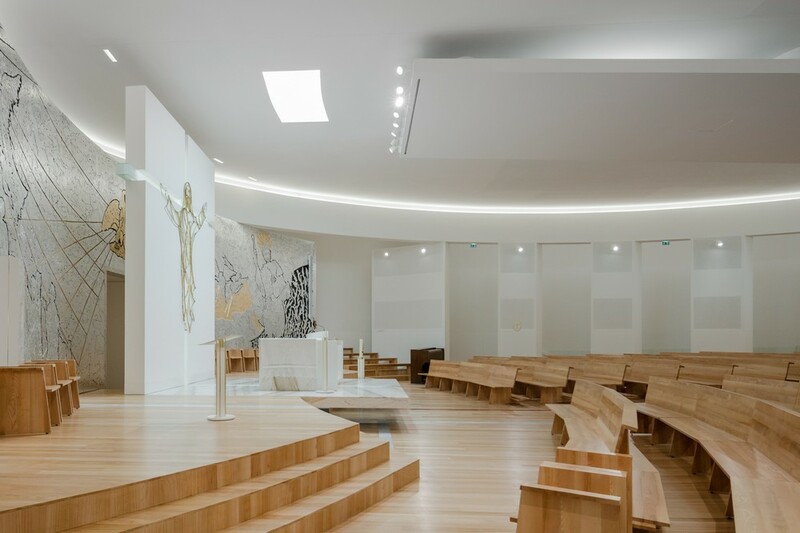 On the other hand, the white interior walls of the nave are illuminated by a diffused light, created by hidden skylights that transmit to the place a serene and poetic atmosphere that evokes prayer and reflection. Lighting plays an important role in the intervention. 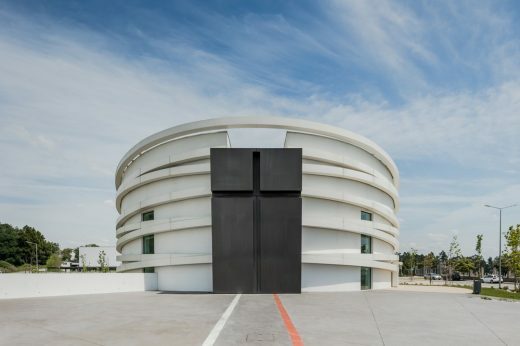 During the night there is a careful and articulate lighting effect, both inside and outside, which was developed with the aim of emphasizing the church. Inside, the only present ornaments are placed in the altarpiece, which consists of two panels that were built in pottery and decorated with gold and silver leaves, with images of St. James and Our Lady of Conception. 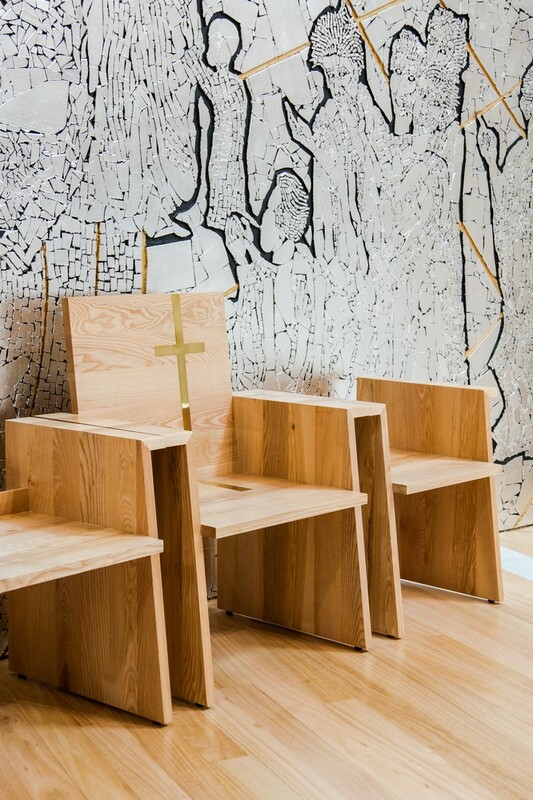 The existing wooden furniture was designed by the team, specifically for this project. The simplicity of space and architectural language present in the project aims to create a space in which the protagonists are essentially the people and the events.